The new Nissan Leaf was one of the stars of Nissan’s stand at the 2017 Tokyo Motor Show (the other being the IMx Concept), and since the second-generation electric vehicle is coming to Malaysia next year, we thought it would be a good idea to provide a small gallery of the new model for you to check it out. Looking rather spiffy in the bright Sunlight Yellow you see here, the Leaf has been completely redesigned for a more dynamic appearance, with on-trend design details including sharp dual-projector LED headlights, blacked-out C-pillars for a “floating roof” look (you can have a black roof as well, as shown on the display car), slim L-shaped tail lights and a sporty rear diffuser. 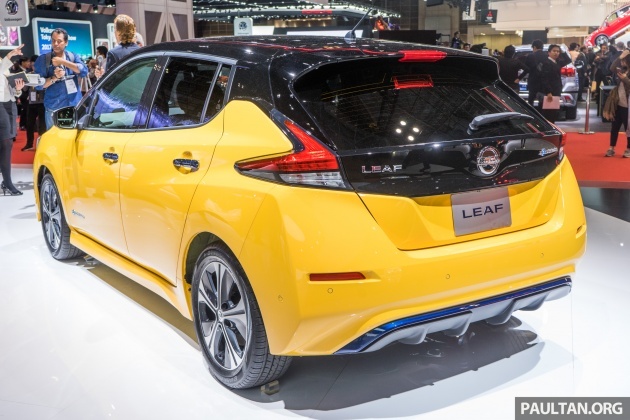 On the inside, current Leaf drivers will be familiar with some of the switchgear such as the climate controls and hockey puck-style gearknob, but everything else is new. There’s a “Gliding Wing” dashboard design, a flat-bottomed steering wheel from the new Serena and an instrument cluster that combines a digital display with an analogue speedometer. The boot now holds 435 litres, enough for two large suitcases. The new Leaf comes with a whole armada of safety systems, bundled in the Safety Shield package. This includes Intelligent Lane Intervention, Lane Departure Warning, Intelligent Emergency Braking, Blind Spot Warning, Traffic Sign Recognition, Rear Cross Traffic Alert, Intelligent Around View Monitor with moving object detection and Emergency Assist for Pedal Misapplication. On top of that, Nissan offers ProPILOT semi-autonomous driving, essentially an advanced adaptive cruise control system with lane keeping. 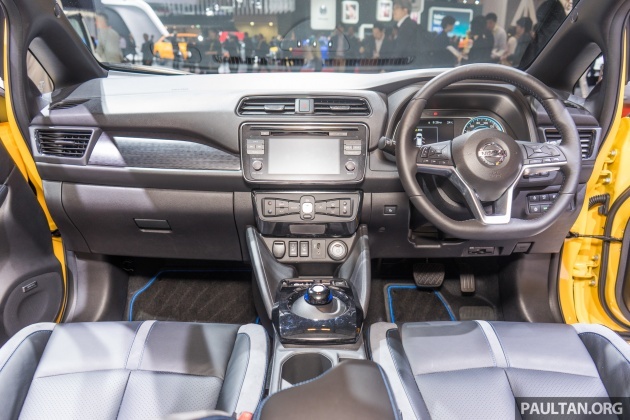 ProPILOT Park, which takes care of finding a spot, accelerating, braking, steering, shifting and applying the parking brakes automatically, is also included. Power comes from a new electric motor that produces 38% more power and 26% more torque, at 110 kW (148 hp) and 320 Nm. Juicing it is a larger 40 kWh lithium-ion battery that increases the New European Driving Cycle (NEDC) range from 195 km on the original (later models could go up to 250 km) to 378 km. The new e-Pedal allows you to speed up and slow down (even to a stop) solely using the accelerator pedal. Nissan quotes a charge time of eight hours from a 6 kW source, and double that time from a 3 kW source; you can also use fast charging to get up to 80% capacity in 40 minutes via the CHAdeMO charging socket. The maximum AC charge rate is 6.6 kW, or 50 kW with DC quick charge. The charging socket array at the front is now flatter to enable customers to plug in a charger without having to bend down. Under the skin, the chassis has been redesigned for better stability, with heavy components such as the battery placed inboard towards the centre of the car. The electric power steering system has also been retuned for a more linear feel and improved feedback. Meanwhile, the ride has been made more compliant with rubber instead of urethane rear bump stops; Intelligent Ride Control, which manages torque generation while cornering, also reduces vibration and improves the ride. Upgrades to the exterior and aerodynamics also reduce wind noise, and optimised inverter rigidity, a noise-isolating power delivery module cover and a quieter motor improve refinement as well. The new Nissan Micra is the better first model to rejuvenate Nissan in the Malaysian scene! All this safety system is useless here because drivers here don’t even know how to use signal/indicator light. What no Automatic Signalling??? Outrageous! My first Micra I bought was RM12,000 in 1988. It was called a Nissan March then. CBU car somemore. I’m sorry even at lower than the Japan price its not going to be very attractive. The interior is just plain plain apart from the EV accents. No new Sentra for Malaysia? Too bad. The Sentra is now on sale in Malaysia as the Nissan Sylphy. The Sylphy is Asean version of US Sentra. Some other country even called the Sentra as the ‘Bluebird’. Aiii… if only it looked like the IDS, I would have been the first to sign up for the purchase. Was hoping so much but looks like it’s a no go for me. 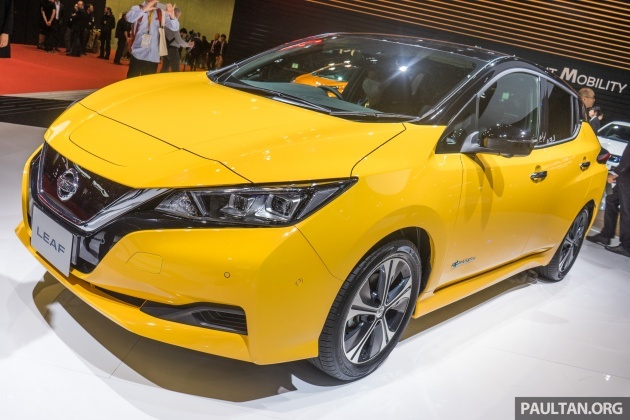 Nissan make some of the ugliest cars atm. But I’m still considering this as a first electric car purchase.